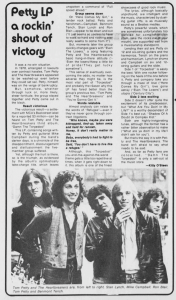 SYDNEY -- Tom Petty rarely ponders on the philosophies of rock and roll. He doesn't bother to dissect or examine its meaning and direction, nor speak of it in complimentary terms. In fact, the Florida-born singer-songwriter prefers to shrug off the music he plays as "disposable crap that won't mean much in 10 years." 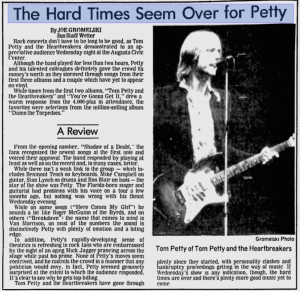 Such an attitude is not surprising considering Petty has just fought his way out of a conflict-ridden year of bitter wrangles with his record company and minor problems with the band, The Heartbreakers. It is also little wonder the singer dislikes interviews, having to recount time over time the feelings of teetering on bankruptcy because his latest album 'Damn The Torpedoes' hit the top 10 in America. On Sunday night at Sydney's Capitol Theatre, Petty and The Heartbreakers proved that they play for the moment, hammering out pacy rock and roll that states everything Petty feels through the lyrics. In a 90-minute bracket they also demonstrated loud gutsy music doesn't need a lot of imagination or individual expression to be exciting. It was a no-win situation. 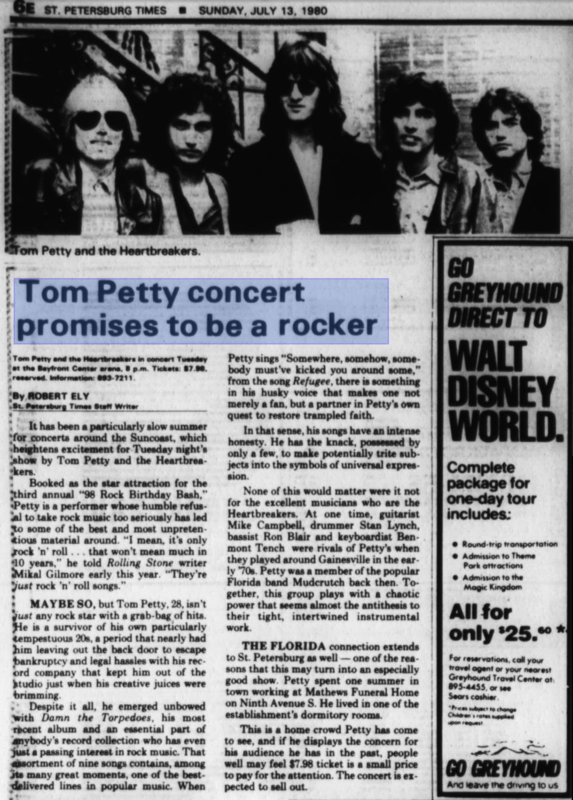 In 1978, entangled in lawsuits over contract hassles, Tom Petty and the Heartbreakers appeared to be washed-up even before they could set sail. Petty, himself, was on the verge of bankruptcy. But, somehow, whether through luck or, more likely, sheer fortitude, the group stayed together and Petty came out in the black. TOM PETTY AND THE HEARTREAKERS: DAMN THE TORPEDOES (MCA): No heartaches here, earaches being the greater likelihood from a combination that sounds like Bob Dylan rocking with the Rolling Stones. 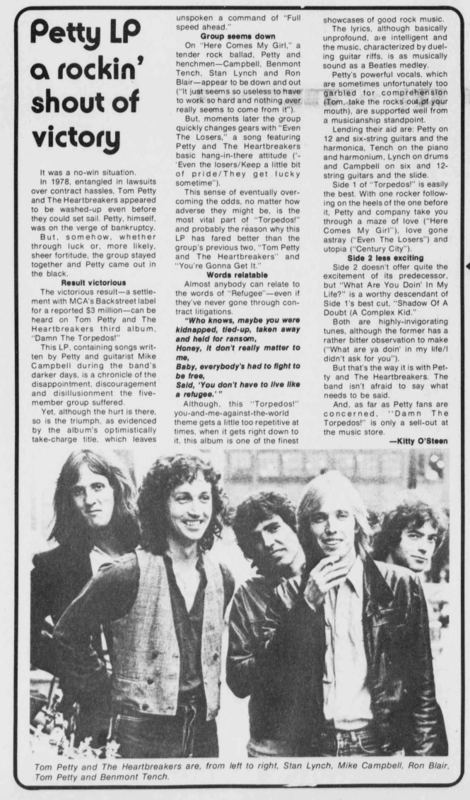 Tom Petty and the Heartbreakers, who were schooling when Dylan and the Stones were at their peak, make up for lost time. Dylan and the Stones' influence run high throughout this loose Rhythm 'N' Blues album, which, like its two predecessors, provide ample reasons for Petty and company's reputation as cult figures. Editor's Note: Thanks to Enric Masclans for Catalan translation. Avui parlarem dels discos més esperats, aquests que quan els veiem en un aparador o en una revista de seguida volem comprar o en tot cas escoltar-los. Uns d'aquests discs és el darrer de Tom Petty and the Heart Breaks; sota el títol "Damm the torpeders" va sortir a França ara fa mig any aquest disc i tot just ara el tenim a casa nostra. És una llàstima que les novetats discogràfiques ens arribin amb tant de re-tard i això és mostra que aquí només els interessa endossar-nos els productes més "patxanguers" que surten al mercat. Totes les cançons d'aquest disc són del més bo i caldria destacar en tot cas la que porta per títol "Refugee" amb uns arranjaments bastant bons dins l'aire més comercial de l'àlbum que és altament aconsellable. Un altre dels discs esperats és el de Bob Seeger titulat "Contra el vent", un bon disc pel aimants de la marxa rockera; tant Tom Petty com Bo Seeger són de Detroit allà és un dels millors llocs per fabricar música rockera. If it weren't for one of the new rock heroes, Tom Petty, one of the original rockers, Del Shannon, might now be twanging his guitar in Nashville. Shannon, creator of such hits of the Sixties as Runaway, Hats Off to Larry and Little Town Flirt, was all set to jump on the country and western bandwaggon last year when Petty's manager called him. A long-time admirer of the rock pioneer, Petty wanted to combine their talents in the recording studio. "When we got together, I had to rock again," Shannon set in Melbourne last week at the start of a three-State club tour (he opens in Sydney on Tuesday at Penrith Leagues Club). "Rock is in my heart." The summer months may have started slowly for concertgoers in the St. Petersburg area, but music fans may want to save their money to attend several shows during July. Tom Petty and the Heartbreakers, who many might consider the biggest concert draw of the summer, finally comfirmed plans to perform in the Bayfront Center July 15. The concert is scheduled in honor of radio station 98 Rock's annual birthday celebration. Tom Petty and the Heartbreakers catapulted to the top of the music industry this year with the release of the band's third album, Damn the Torpedoes. The group's first two albums had received critical praise, but the new album made the band a top concert act and led to international airwave attention. Rock concerts don't have to be long to be good, as Tom Petty and the Heartbreakers demonstrated to an appreciative audience Wednesday night at the Augusta Civic Center. 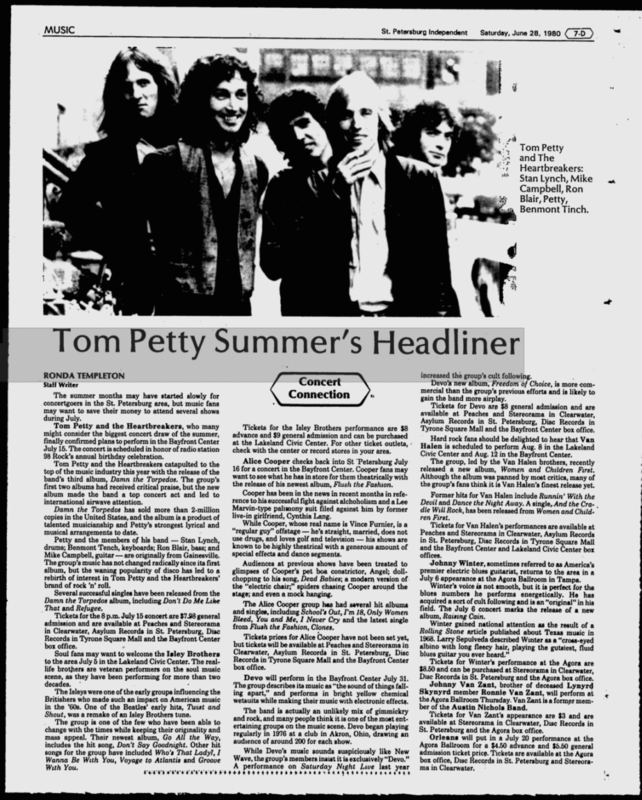 Although the band played for less than two hours, Petty and his talented colleagues definitely gave the crowd its money's worth as they stormed through songs from their first three albums and a couple which have yet to appear on vinyl. 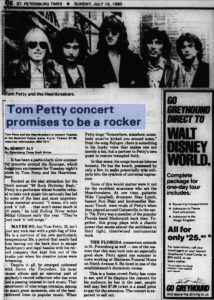 While tunes from the first two albums, "Tom Petty and the Heartbreakers" and "You're Gonna Get It," drew a warm response from the 4,000-plus in attendance, the favorites were selections from the million-selling album "Damn the Torpedoes." From the opening number, "Shadow of a Doubt," the fans recognized the newest songs at the first note and voiced their approval. The band responded by playing at least as well on the record, and, in many cases, better. It has been a particularly slow summer for concerts around the Suncoast, which heightens the excitement for Tuesday night's show by Tom Petty and the Heartbreakers. Booked as the star attraction for the third annual "98 Rock Birthday Bash," Petty is a performer whose humble refusal to take rock music too seriously has led to some of the best and most unpretentious material around. "I mean, it's only rock 'n' roll... that won't mean much in 10 years," he told Rolling Stone writer Mikal Gilmore early this year. "They're just rock 'n' roll songs." 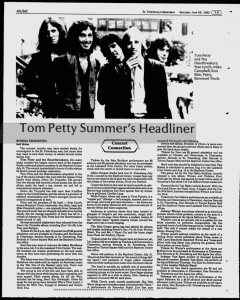 PROVIDENCE -- "Damn the Torpedoes" is about to pass the two million sales mark, but Tom Petty and the Heartbreakers' Providence performance at the Ocean State Theatre last week was already every bit a live, double-platinum show. Petty's latest album, his third, has been well up on the national charts for over eight months. It's still holding its own among the top 30 LP's, and if Petty's first two releases didn't establish him as a solid mainstream rock contender, "Damn the Torpeodes" certainly has. His material may be considered derivatice, up-date '60s rock and roll, but this album is appealing, it's well-balanced, there are plenty of good cuts, changes of face, and instrumental licks. Benmont Tench's keyboards have a wonderful, light touch, the guitar work is great, and Stan Lynch's drums and vocal harmonies are solid background for the Heartbreakers' convincing overall performance -- but Tom Petty and his band are at their peak in concert!